Today, the Fisheries Statistic Division of NOAA Fisheries’ Southeast Fisheries Science Center released its report regarding shrimp landings in the Gulf of Mexico for June 2018. Shrimp landings in the Gulf of Mexico last month were at 10.4 million pounds, below the 10.9 million pounds landed in June 2017 and 38.9 percent below the prior sixteen-year historical average of 17.1 million pounds for the month of June. 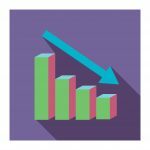 Landings on the West Coast of Florida, reported to be 189,000 pounds for the month, were the lowest recorded for any June in the seventeen-year dataset compiled by the Southern Shrimp Alliance. Landings in Mississippi, at 879,000 pounds for the month, were the second lowest recorded for any June in that seventeen-year dataset. In contrast, landings in Louisiana last month were at 5.7 million pounds, up from 4.5 million pounds in June 2017, while landings in Alabama were reported to have increased for the third straight year, from 1.4 million pounds in June 2017 to 1.6 million pounds last month. For the first half of 2018, a total of 38.6 million pounds of shrimp have been landed in the Gulf of Mexico, down from 41.2 million pounds over the first six months of last year. In total, landings this year are 11.2 percent below the prior sixteen-year historical average of 43.6 million pounds. 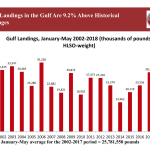 Although landings for the first half of the year are up for Louisiana (18.6 million pounds) compared to last year (17.2 million pounds), landings for every other state are down compared to 2017. For the tenth straight month, no ex-vessel prices were reported by NOAA for the eastern Gulf (the west coast of Florida). Ex-vessel prices reported for the northern (Alabama, Louisiana, and Mississippi) and western (Texas) Gulf for all shrimp of 26/30 count or smaller were lower – as much as 15 percent lower – than those reported in June of last year.